Sewing a baby bib is a simple and fun way to welcome a new little one to the world. Bibs make great gifts, and they're also practical items to take to craft fairs. Use these exclusive free baby bib sewing patterns to make a custom creation for a special baby. 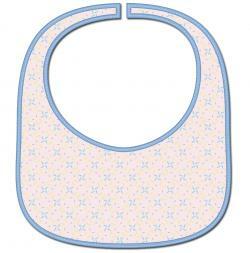 Print this simple infant bib pattern. Although the youngest babies aren't eating solid foods yet, they do need bibs to protect their clothing from drool and spit-up. You don't need any special sewing experience to make this project. You can use this pattern to whip up a simple infant bib in about half an hour. If you need help downloading the pattern, check out these helpful tips. Print out the free pattern. You won't need to enlarge it. Cut out the pattern and pin it to your fabric. Cut out your fabric piece. Starting at the back of the neck, carefully pin seam binding around the outside edge and neck hole of the bib, making small folds to help the binding follow the curve. Tuck the raw edges under. Use your sewing machine to topstitch the binding in place. Remove the pins and check that the binding is secure. Sew the hook-and-loop closures in place at the back of the neck. 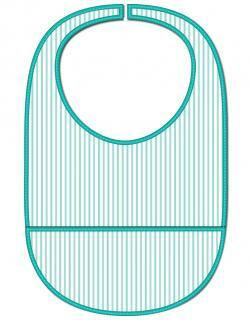 Print this pocket bib pattern. 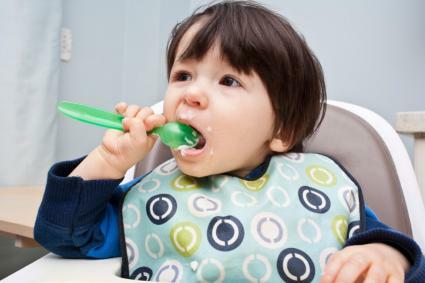 A pocket bib is handy for older babies and toddlers, since it can catch crumbs they may drop as they eat solid foods. This pattern works well with any heavy-weight fabric, but vinyl is a great practical choice for easy clean-up. You don't need a lot of sewing experience to make this, and it will take less than an hour for most seamstresses. Print out the pattern for the pocket bib. It's two pages long and does not require enlarging. Cut out both pieces. Pin them to your fabric and cut out the fabric pieces for the bib. Place the wrong sides of the pocket pieces together, lining the pieces up carefully. Pin seam binding along the top edge of the pocket and topstitch it in place with the sewing machine. Align the pocket with the bottom of the bib body and secure it with pins. Starting at the back of the neck, pin the seam binding around the outside edge and neck hole of the bib. Use the sewing machine to topstitch the seam binding in place. Remove the pins and double-check your stitches. Sew the hook-and-loop closure at the back of the neck. 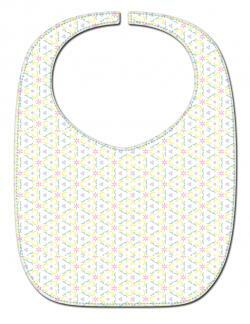 Print this reversible bib pattern. A reversible bib is both cute and practical. You can use two complementary fabrics to give it a stylish, sweet look. When one side gets dirty, it's easy to flip the bib over to have a clean side. Choose washable fabrics, including cotton prints and knits. This project is a little more complicated, but it is still easy enough for a beginning seamstress. It will take about an hour. Start by printing out the pattern. You won't need to resize it. Cut out the pattern and pin it to your first fabric. Mark and cut out the fabric, taking care to properly cut the notches. Cut out your second fabric, carefully cutting the notches as marked. Place the right sides of the two fabric pieces together, lining up the notches. Pin the two pieces together. Using a quarter-inch seam allowance, as marked on the pattern, sew around the outside of the bib, leaving a small section open for turning. If you're using a knit fabric, set your sewing machine for a zig-zag stitch. Sew the inside of the neck hole, as well as the ends at the back of the neck. Turn the bib right side out. Fold the raw edges under in the spot you left open, and pin them together. Press the entire bib, taking care to give it the right shape. Starting at the open area, top stitch the bib about one eighth of an inch from the edge. Sew the hook-and-loop closure in place at the back of the neck. Avoid string ties on bibs, since these can be a strangulation hazard. Instead, use a snap, or even better, a hook-and-loop closure. Choose fabrics that are easy to wash. Babies get messy, and new moms don't have time to hand wash things. Select soft fabrics for infants, who often have very sensitive skin. Consider your sewing experience before choosing a pattern. These bib patterns are perfect for beginners, but some projects are more complicated. Always read all of the instructions before starting the project. Avoid adding buttons and other dimensional embellishments to your bib. If the threads come loose, the baby could choke on these items. No matter which baby bib pattern you choose, you can take pride in creating a baby gift that's as special as it is practical. In addition to keeping baby's outfit clean, your bib will show the world how much you care about this new little one.